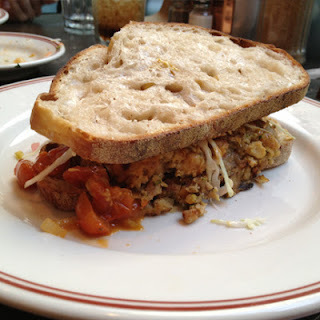 oh, stephanie izard. how i adore thee. not only have you created the fantastic girl & the goat, which i freaking love ... but you have now outdone yourself with little goat diner. a glimpse of the vegan menu. i want to try it all. literally. and i plan to. little goat also has separate dairy-free & gluten-free menus. what's not to love?? 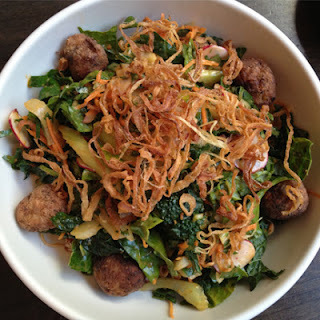 crisp chick pea fritters, kale, chopped veggies & lemon-kimchi vinaigrette. wow, so delicious. the chick pea fritters are super light, unlike your usual falafel ... and incredibly flavorful. i love a big bowl of kale, so i certainly appreciated that ... and the lemon-kimchi vinaigrette added the perfect little kick. basically, the ideal salad. 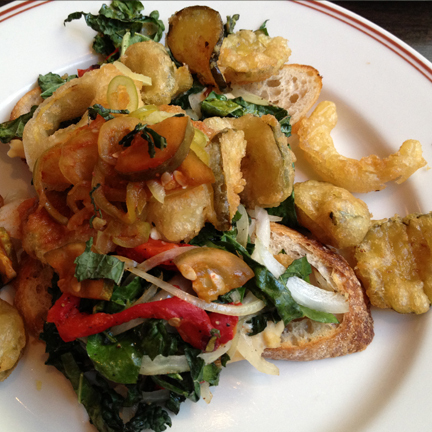 fried pickles, pickled onions, kale, roasted pepper & hummus on toasted sourdough. this sandwich consists of all of my favorite things. fried pickles, kale, hummus & sourdough? perfection. and i was not let down. i ate it mostly with a fork, since it was open face & i didn't want get too sloppy, but that worked just fine. i was able to get all the various flavors & textures in each bite. simple set ... sourdough, smoked tomato relish, dijon & cabbage. one of my dining partners (hi, blair!) opted for the vegan burger. which she let me sample. also fab. simple & tasty : not much more you need. the smoked tomato relish was definitely the star of this dish, in my opinion. sorry that it's kind of hidden by the fresh sourdough. 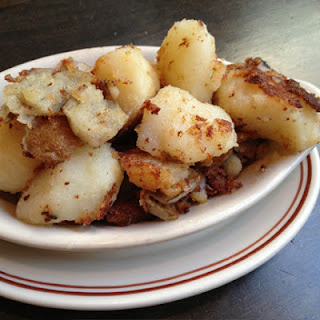 crispy, greasy potato goodness? again, can't ask for much more. vegans, little goat is seriously a must-eat. it's a definite new favorite for me ... the decor is awesome, the atmosphere is fun & the food is amazing. i'm already thinking of what else i want to try off the menu... it's going to be a good summer! new york city : alice's tea cup - chapter 2.
new york city (astoria, queens) : bareburger. columbus, ohio : pattycake bakery. columbus, ohio : northstar cafe.